14 karat yellow, rose and white gold, quartz tube, placer gold. In the collection of the Museum of Arts and Design (MAD), New York City. "I am thrilled that the Museum of Arts and Design (MAD), at Columbus Circle in Manhattan, has included “Placer Gold” in its permanent jewelry collection. 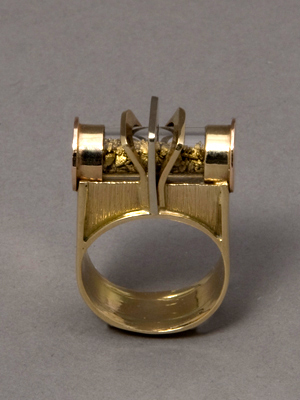 I designed and fabricated this ring many years ago as a gift for my friend and colleague, Charles Stewart. Charles offered the ring to MAD in 2009 and to my delight the curators accepted the ring; now it has come out of the museum's archives and will be on exhibit in the show "Potpourri". You can see this and many other beautiful jewelry art creations by renowned jewelry designers at the museum from March 12th through June 2nd.